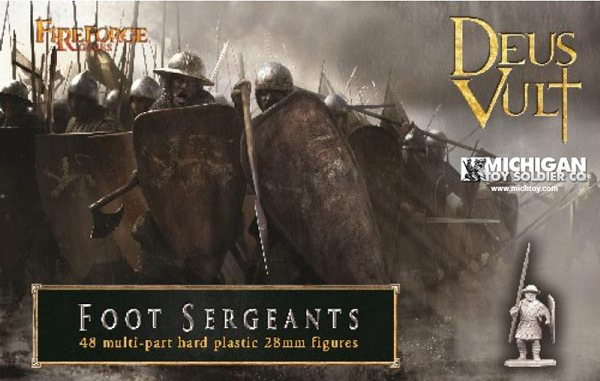 The Foot Sergeants set will allow you to build up to 48 Foot Sergeants miiniatures or up to 24 crossbowmen and 24 Foot Sergeants, in medium armour. * Heads - 10 different heads in six sections for a total of 60 heads in the set. * Bodies - 6 different infantry bodies in very dynamic and realistic poses. * Melee Weapons - 6 different right arms armed with spears, 2 with swords, 2 axes and 2 maces. Six weapon sections for a total of 36 spears, 12 swords, 12 axes and 12 maces. A huge total of 84 right arms with weapons. * Crossbow - 4 different sculpted couple of arms with crossbow. You can build up to 24 foot crossbowmen from the set. * Shields - 4 different shield types and 4 different left arm poses not attached to the shields. There are 48 shields and left arms in the box. * Various - Sword scabbards and crossbow quivers not attached to the bodies.